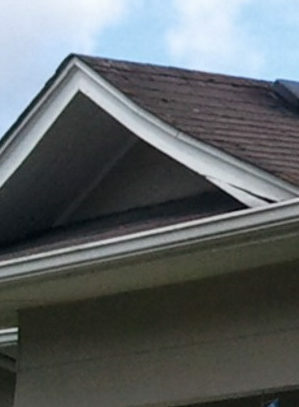 Determine where the sag is in your roof in relation to your attic. Grab a flashlight and head up to your attic to inspect your roof rafters and decking – specifically those where your roof is sagging. Look for damage that includes cracks, rot, breaks, and any other impairment. To get your truss or rafter back into shape, you can use a steel “L” channel. First, use your drill to drill four holes in each side of the “L”. Next, use a chisel to remove any pieces of wood (such as splinters or broken scraps) that may get in the way of your repair. Using the holes you drilled, fasten the end of the channel to the truss or rafter using your bolts and washers. Once the end is in place, move the broken piece into position. Determine the gap between the channel and the truss or rafter and choose bolts that are 1 1/2″ – 2″ longer than the gap. Insert and tighten the two bottom bolts until the washers are flush with the channel. Then, tighten the bolt farthest from the crack or break until the other bolt head is about 1/4″ from the channel. After that, tighten the back bolt until it’s close against the channel. Then, tighten the front bolt until the back bolt is about 1/4″ from the channel. Continue tightening both bolts back and forth until the truss or rafter is securely against the “L” channel. Insert bolts into the rest of the holes in the channel and tighten. Once your truss or rafter is back into place, it’s a good idea to add additional support to the area. First, remove the gusset plate that has partially or fully pulled away from the two pieces of wood. Because it’s nearly impossible to reinstall the plate, replace it with a 1/2″ plywood gusset. Use a pneumatic nail gun and nails to attach your gusset on both sides of the wood pieces. This should replace the strength of the original gusset plate. Measure the damaged area between your roof rafters or trusses. Cut a piece of 1/2 inch plywood that will cover the area. Because driving nails up into the sheathing material will make things worse, glue a piece of 1-inch rigid Styrofoam to your piece of plywood. Next, place your piece of plywood and Styrofoam foam-side-up against the damaged roof decking. Push up on the plywood until the foam is touching the underside of the roof decking. After that, use a piece of lumbar strapping to keep the plywood in place until you can get a roofing repair expert to fix it. That’s how to fix a sagging roof.